Improving education in both schools and universities is one of the causes I care about the most. I have long been a governor of Northampton Academy and chaired the board when it opened in 2005 as only the 15th academy in the country. I am hugely proud of the work everyone at Northampton has done to turn a seriously failing secondary school of 1,250 pupils into one that achieves grades above the national average. It was a tough challenge that included building a new leadership team with a real can-do approach and the self-belief they needed to tackle issues ranging from deprivation among pupils’ families to behavioural problems and cultural change for teachers and unions. For five years, I was also a director of United Learning Trust, which runs the largest group of academies. I shared my experiences turning round Northampton in a 2008 report for the think tank Reform, which included a series of recommendations on how to expand the academies programme. My report was welcomed by the then Labour government and helped to inform the academies policy drawn up by the Conservatives in opposition that led to the rapid acceleration of the programme after the 2010 election. More recently, I have been campaigning to get a better deal for university students. In Autumn 2017, I released my analysis of what is going wrong in universities and how to fix it, attracting extensive media coverage. Timebomb: how the university cartel is failing Britain’s students included recommendations on how to promote far more two-year degrees. We had discovered tremendous unmet demand among students. The report gained cross-party support. 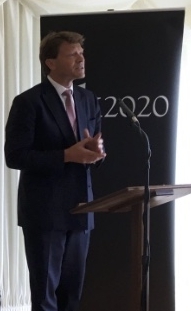 It featured a foreword by Lord Adonis, the former Labour schools minister, and by Sir Anthony Seldon, vice-chancellor of the University of Buckingham. It was cited by Jo Johnson, then universities minister, in a major speech in 2017. I produced a follow-up report on finances called Defusing the Debt Timebomb. I gave a presentation to Philip Hammond, the Chancellor, and Treasury officials on our findings and recommendations. It was a timely intervention ahead of the Prime Minister's Student Funding review announced in February 2018. My own university education studying construction economics and quantity surveying at Salford helped me hugely in the early part of my career.